Whenever I reflect on times in my life when I haven’t been terribly well behaved, I’m reminded of the truth in this statement. Our emotions tend to have a significant influence on our behaviour choices. So it seems important to start a discussion about behaviour guidance in young children with the same motto, since children find the same to be true. When infants and young children are upset, frightened, worried or stressed, their natural instinct is to turn to us for comfort. How we then respond to this need for comfort will, in part, determine the events that follow. We know from neuroscience research that children calm down most effectively when we make an effort to connect with them and respond to them with empathy. Alternatively, if we choose to distract a child, with no acknowledgement of her feelings, or if we instead provide an explanation of how unfounded her distress is (however logical this may seem to us), the child’s feelings of distress will actually last longer. Importantly, if this pattern is repeated often enough, the child will also learn that there is little benefit in seeking our help when she feels upset. And what happens when the same pattern is established with each of the children in your care? You may find yourself working with children who are often upset for protracted periods of time, feeling that they have no-one to go to for help to calm down. Some may demonstrate this by withdrawing from you and their peers, unable to engage in activities and learning for a while. 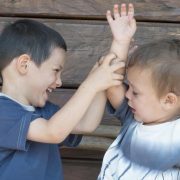 Others may act out, hurting their friends, damaging toys or yelling. While this is an overly-dramatic example, you can see how easy it might be to get stuck in a pattern of reacting to children’s behaviours rather than responding to their underlying emotional needs. Remember, “we are all more likely to do good when we feel good”. One of the most important things you can do when you are trying to improve children’s behaviour is to teach them that they can come to you when they’re feeling upset and that you will help them to calm down, before their feelings get too big for them to handle. By taking this approach, you will not only prevent many unwanted behaviours, but you will also strengthen your relationships with the children in your care. These strong, respectful relationships will, in turn, provide a range of added benefits to each individual child and to your group as a whole. But what about those children who seem to present with challenging behaviours in spite of your efforts to help them to regulate their feelings? In these situations, it helps to be curious about what might be happening for these children to behave in this way. Perhaps he’s hungry? Tired? Stressed as a result of the fights his parents are having at home? Maybe he’s frustrated by his speech delay – he has so much to say and doesn’t seem to be able to get the words out clearly. Perhaps she’s finding it hard to read other people’s social cues and needs for someone to bring her parents’ attention to her struggles, so that they can seek appropriate help for her. Perhaps she’s been taught at home that hitting and yelling are reasonable strategies when feeling frustrated with someone’s behaviour. The reality is, there isn’t one reason why children present with challenging behaviour. Just as there isn’t a sole reason why we are sometimes not at our best. With this understanding, it follows that there is no effective one-size-fits-all strategy for addressing children’s challenging behaviours. The approach for the behaviour of a hungry toddler who has been brought to your centre having not eaten breakfast cannot be the same as for a frustrated, speech delayed preschooler who is being teased by his peers. In both of these examples, each child has a different problem and as such, will require a different solution. That’s not to say there is no helpful approach to guiding children’s behaviour; Only that there is not one helpful approach. In fact, there are many helpful strategies and practical activities that you can use to guide children’s behaviour in your centres. Indeed, an important part of your role is to teach children socially appropriate behaviour. And just as you use a variety of helpful approaches to teach children other new skills such as counting or letter recognition, the same concept applies – there are many strategies for teaching children to behave in socially appropriate ways. Never forget, you are an educator teaching children important life skills. So do what you do best! Develop strong relationships with children so that they know that they can come to you, however they’re feeling; Then teach them how to treat themselves and others in ways which will set them up for success, not only in your centre but all throughout their lives. To learn the strategies for addressing children’s challenging behaviours in ECEC settings, you can register now for Dr Kaylene Henderson’s upcoming webinar. Or sign up for her highly regarded online course series for educators, ‘Raising Good Kids: Managing Behaviour and Emotions in Early Childhood Care and Education Settings’. Together, we can bring out the best in the children for whom we all care. The topic of childhood trauma is a difficult one to discuss. Not only is it confronting to consider children’s experience of trauma and abuse but naturally this topic can be triggering for many adults too. Yet it’s important that those who work with children have an understanding of the many, complex ways in which trauma can present and feel empowered to help. While many children experience upsetting and frightening events, the term ‘childhood trauma’ most commonly refers to relational trauma – the experience of a caregiving relationship as frightening, abusive or unresponsive. Sadly, many young children experience abuse, neglect and family violence within their homes, which can be further complicated by a parents’ mental illness or substance use. In these situations, young children are doubly affected – not only by the traumatic incidents themselves, but by the lack of healthy supportive caregiving relationships, critical for healthy early development. To know how best to help, it’s important that we first understand the impact that trauma has on children. Unfortunately, there’s no simple formula for predicting this. Instead, we consider the complex interplay between several factors. These factors include the nature, severity and duration of the trauma, the temperament of the child and the level of support and quality of any other relationships available to the child. There are also other factors to consider too. Was the child exposed to drugs or alcohol while in the womb? What was the extent of any physical injuries or nutritional deficiencies experienced? Consider too the degree of financial hardship felt by the family since this factor, like many others, will further influence a child’s outcomes. Age matters too of course. During the first year of life, important brain pathways develop making the first 12 months a particularly critical period. When infants experience trauma during this period, the impact tends to be much greater. Given how many different factors are at play, it makes sense then that the effects of trauma can vary too. Children will also often find it hard to calm down from big feelings states and may have come to rely on physical strategies such as rocking or head banging. They may find it difficult to problem solve or to control their impulses. It helps to understand too that children who have been maltreated often never reach a totally calm state and may instead always be on the look out for danger. Because they’re often on edge, children can find transitions particularly hard to deal with and may over-react to seemingly minor changes in their routine or environment. These kids may struggle to ‘read’ others’ facial expressions and intentions and will often experience difficulties relating to their behaviour. 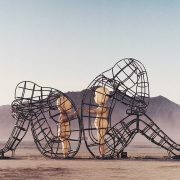 Children who have experienced early trauma also often develop what we call a ‘negative internal working model’ – that is, they may have learned to see themselves as unlovable/ unworthy, others as rejecting or unavailable and the world as unsafe. And these differences in how they see themselves, others and the world will naturally influence how they interpret various situations and, importantly, how they choose to respond. Of course, the earlier we get in to help, the better. It’s critical that we ensure children’s current safety and that children and their carers are linked in with professional support services. That said, educators can do a lot to help too. I cover these practical healing strategies in detail in my webinar series for early years educators but the foundation for all of these approaches is for educators to build strong positive relationships with children. This really is the key to helping children heal. This is where things first went wrong and is the most important place to start when setting things right. Once we have this foundation, we can start to address any of the important developmental tasks or skills that a child may not have gained but they first need to feel safe and accepted by us in order to learn these. 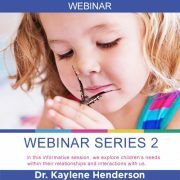 To learn specific strategies for helping children heal from childhood trauma, educators can register for Dr Kaylene Henderson’s Webinar here. Please note, you will need to download your certificate for your Course Status to be recorded as ‘Completed’. One of the most challenging aspects of an educator’s role is managing children’s behaviours. What is reasonable to expect of educators? Which strategies are supported by research? Is there a magic one-size-fits-all approach to discipline? Join trusted Child Psychiatrist Dr Kaylene Henderson as she addresses the important topic of challenging behaviours in young children. Feel more confident in your important role knowing that you are guiding children in ways that really benefit them (while making your job easier too!). This is a helpful and highly practical session, not to be missed. Sadly, many children in care and education settings have experienced early childhood trauma. The impact of this can be widely felt, yet there is little guidance for educators on how they can help. Join trusted Child Psychiatrist Dr Kaylene Henderson as she covers this important topic. Learn about the impact of trauma on the developing brain, the ways in which this might present in your service and practical ways in which you can help both children and their families. There is so much you can do to help in your important roles – Don’t miss this important learning opportunity. Join trusted Child Psychiatrist Dr Kaylene Henderson as she teaches you all you need to know about anxiety in young children. Learn about how and why anxiety presents in children, when to ‘worry about worry’ and how you can help the children with whom you work. Learn practical skills and strategies for helping children and parents manage separation anxiety and ways to foster greater resilience. This is a not-to-be-missed session! In this informative session presented by Dr Kaylene Henderson, we explore children’s needs within their relationships and interactions with us. In particular, you will learn ways to interact with children to promote a secure attachment style. While we know that a secure attachment style promotes best outcomes for children, how commonly does this occur? How can we better support children and also their parents in order to promote this? Finally, building on this foundation, we will look at other factors that influence children’s development and at how you can best teach and support children within ECEC settings to enhance their developmental outcomes. In this informative and engaging session, adapted from the acclaimed ‘Raising Good Kids’ online course series and presented by Dr Kaylene Henderson, you will learn how to promote early emotional literacy among the children in your care. You will also learn about how children develop the capacity to regulate their feelings and how best to promote this development. Importantly, you will also learn the most effective approach to take when children are feeling upset, experiencing separation distress or experiencing a ‘meltdown’. Don’t miss this practical session for educators working with 0-5’s.